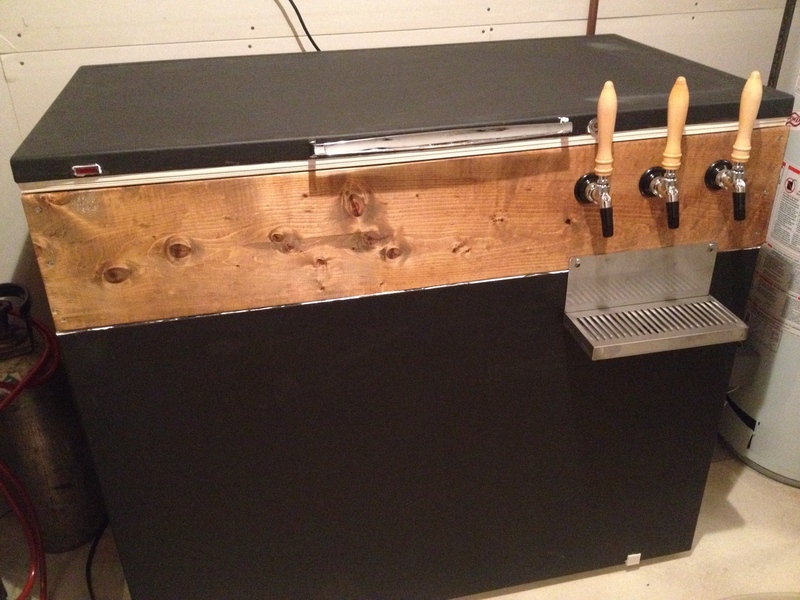 The final product: our first keezer. As I get older, the interval between one New Year’s Eve and the next seems to get shorter and shorter. I guess that means that it’s time to start making the best of things! And in 2014, I think that’s exactly what we did. After a long hiatus, L and I finally restarted our home brewery and it has been a rewarding and highly successful experience. We dusted off much of our old equipment, pruned everything that didn’t work, and even developed some ‘new fangled’ pieces (e.g., our keezer; but more on that later) that have since found their place in our system. From our humble beginnings in the spring until now, we have made 10 memorable batches—and we’re just getting warmed up. We started with a fairly simple pilsner, just to regain our home brewing sea legs. The beer turned out pretty good, but it also pinpointed exactly where we needed to focus our attention to improve our process. Our extraction efficiency was much lower than what we were expecting. Part of it was our bumbling and fumbling with the process as we pulled deep from our fading collective memory to recall what worked like a well-oiled machine in days gone by. But with each successive batch, our system improved. Our last batch, an oatmeal stout brewed just a couple of days prior to this writing, was completely finished from ground grains to an active primary in just over 4.5 hours, with 77% calculated efficiency—a brewhaus record on both counts! 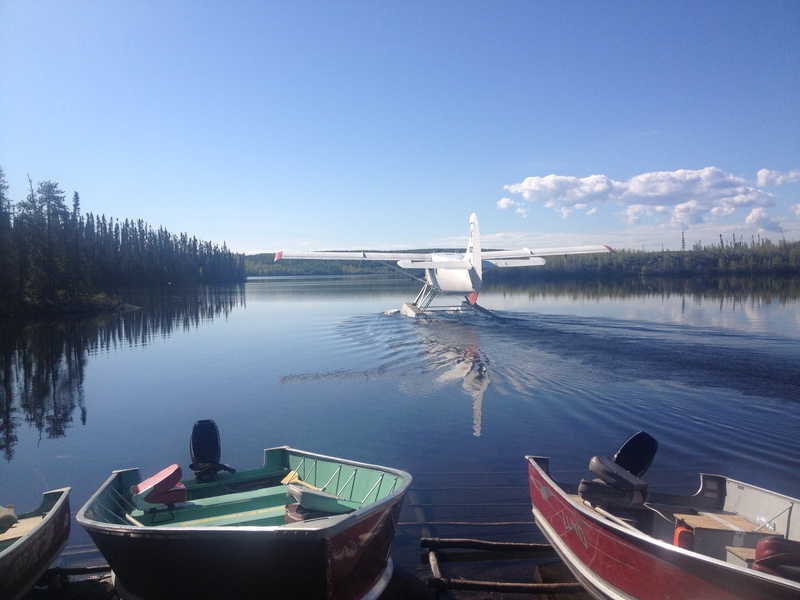 Our float plane dropping us off at our fly-in fishing camp for a week of lake trout fishing, June 2014. Kegs and coolers are an awkward pair. We had to rig a system to cool our beer without proper refridgeration. We spent the first night of the trip in a log cabin on a staging lake before we flew into our fly-in camp the following morning. It was there that we cracked the keg at the behest of one of my fishing companions. It was a long drive to that cabin and the beer was warm. We had no real way to cool it. So we rigged up some weird system in a cooler where the dispensing line snaked through ice water, which cooled the beer (a bit) before it flowed into a plastic beer cup. It seemed to work, because before anyone was done their first beer, everyone was raving about how “it doesn’t even taste like home brew!” “Seriously, this is good beer!” “Pour me another!” And before we knew it, the keg was done. It didn’t even make it into the fly-in camp. It died on the first night. I was proud. Mission accomplished. The transformation was not as sudden as I’m letting on. A few years ago, we found ourselves melting under the scorching sun of East Africa. We dared not drink the water, and the sugary alternatives just weren’t quenching our thirst. That was the first time I saw L order a beer—a Tusker. As she tilted that first one back, all of her spirit renewed in the ice-cold goodness, I knew that she would be curious about what all the fuss was about. And it was there, in an open-air bar in Nairobi, Kenya, that her curiosity in beer began. It was here, in our home brewery, where it has matured into what I could never have imagined only a few short years ago! Together, we joined a local home brew club. Because she has been participating in making beer for years, it turns out that L knows more about beer and brewing than most of the members of the brew club. She participates in the discussions, critiques the beer samples, and offers advice for improvements. She’s now formulating her own recipe for her first ever solo brew, which should happen early in the new year. I am proud. Mission accomplished. Our home brewing journey will continue with enthusiasm in 2015. We have decided to enter some of our latest creations into our very first beer competition (not my idea—I’ve never thought of brewing as a competitive sport; this is at the insistence of my new brew monster). We have also downloaded study materials for our BJCP certification in anticipation of having to judge a local competition, and to elevate our home brewing game to the next level. In the meantime, we will expand our brewing operation with some equipment redesign or replacement. It will be another busy brewing year. In sum, 2014 has been a busy and productive year in beer. We have met some wonderful people along the way, both locally and online. This blog, which was also started in 2014, languished for a little while (owing to competing time demands). If the choice is between writing about brewing or brewing, I will choose brewing every, single time—as I will inevitably do this coming year, as well. Having said that, thanks for reading, and we will look forward to brewing with you well into 2015. Happy New Year! A fermenting wort is in many ways like a living organism. Watch it carefully and you can see it metabolizing before your very eyes. Trub rises and falls inside the fermenter like an open circulatory system. A fermenting wort can increase in temperature by 4ºC or more over ambient temperatures. And most obviously, it respires, as evidenced by the rhythmic gurgling of a CO2 lock fixed to the mouth of an active fermenter. Although a fermenting wort seems like it’s alive, it’s the yeast that makes it seem so. 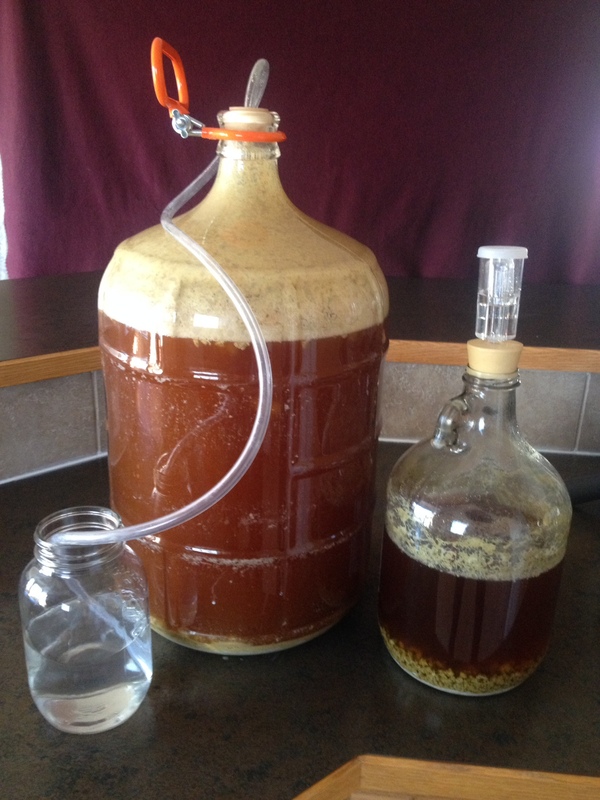 As every brewer knows, yeast is the magic in the carboy—the living component. As long as you’ve done your job as a brewer and provided your yeast a suitable habitat, it will do its job and repay your efforts in beer. You would be hard pressed to find a more rewarding mutualistic relationship with humans than the one we share with yeast. It just doesn’t seem fair that we should let our yeast die after fermenting only a single batch, especially when it has so much more life (and beer) to give. In honour of my yeast’s hard work and dedicated service to my craft, I take it as my personal responsibility to extend its life as long as reasonably possible. By doing so, every batch of yeast started from a pure culture can be extended by approximately five times its single-generation life span. To extend my precious yeast’s life, I first wash it, give it a comfortable place to sleep, and then wake it up and feed it a yeast’s feast, for which I receive beer in return. 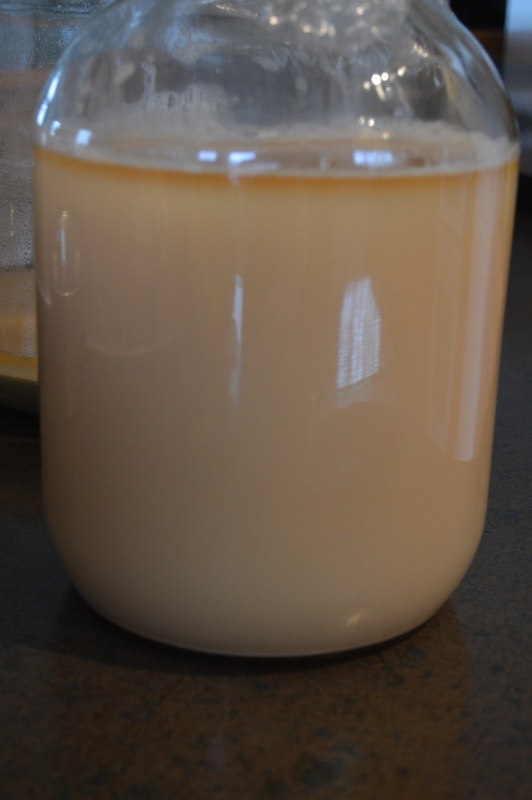 Layers forming after the first wash inside a carboy. The sludgy bottom layer is debris (to be discarded). The milky middle layer is basically active yeast, with a thin layer of beer on top. After a yeast has worked tirelessly for a week or so in a primary fermenter, it’s tired and dirty and needs to be washed. Washing involves separating the active yeast from all the other debris in a primary fermenter, such as spent yeast, hops, trub, as well as miscellaneous proteins, fats, and other particulate matter. This separation can be accomplished in a few simple steps, always making sure to keep everything sterile so as not to contaminate the yeast. Step 1: Separate the active yeast from the bulk of the remaining debris after racking. After you’ve racked your beer from the primary fermenter (I brew 19 L batches and these methods reflect my process; they can easily be scaled if you produce different sized batches than mine), add 4 L of temperature-matched and sterilized (i.e., boiled for about 15 min. and cooled to the fermenter’s temperature) water remaining at the bottom of the primary fermenter. Swirl the debris around to ensure that everything goes into suspension with the added water. It’s important that the water is temperature-matched with the fermenter to ensure that the yeast you’re trying to wash does not become damaged by a temperature shock. Cover the fermenter to prevent contamination, and let the slurry settle for approximately 15 min. Step 2: Decant the active yeast fraction into a smaller vessel. The active yeast fraction from the primary fermenter can be decanted into a smaller vessel and again allowed to settle for about 15 min. This process further separates active yeast from undesirable debris. Notice the much reduced bottom debris layer and the proportionally larger active yeast layer. After the slurry has had a chance to settle, you’ll notice that it has clearly separated into a thick bottom layer of debris (to be discarded), a cloudy layer of active yeast in suspension, and possibly a thin layer of beer left over from the rack (which can be safely ignored). Carefully decant the upper layer of active yeast into a sterilized 4 L container while leaving the debris behind. I prefer a clear glass container for this so that I can see when the various fractions have separated. Cover the container to prevent contamination, and let it stand for an additional 15 min. so that separation can once again occur. Step 3: Decant the active yeast fraction into smaller containers for long-term storage. This is the second washing step. As in Step 2, decant the upper active yeast fraction into sterilized 1 L containers. I use mason jars for this step so that I can put sterilized lids on the containers for long-term storage. Seal and store. Step 4: Refrigerate the yeast for long-term storage. Refrigeration will cause the active yeast to enter a state of temporary dormancy which will allow it to be stored for an extended period. 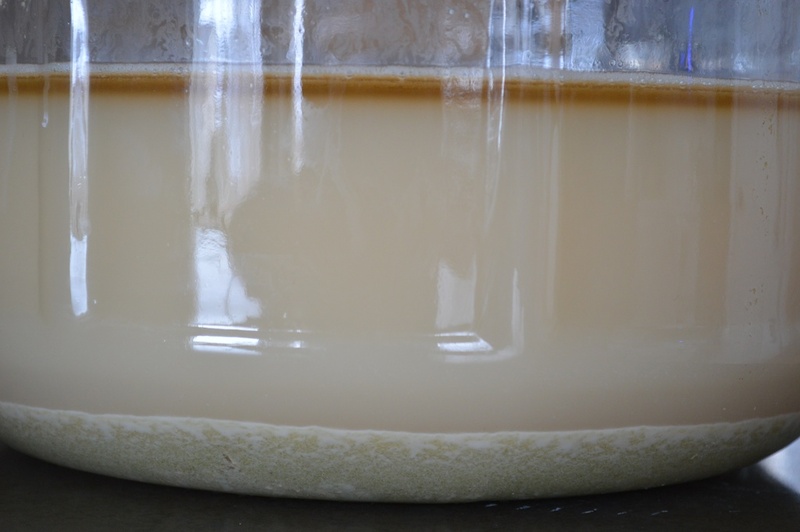 The washed yeast enters a state of temporary dormancy after 24 h of refrigeration. You should be able to get away with several weeks to months; although, some have reported successfully storing yeast this way for a year or more. Your mileage may vary. In order to revive the yeast, simply remove it from the refrigerator and allow it to slowly come to room temperature. Once there, swirl the dormant yeast into suspension and start building a starter, as per your normal practice. Death is an essential part of life. Sometimes it’s in a brewer’s best interest to know when to let their favourite yeast die. The first time you pitched that yeast, it was likely from a pure culture. It was young and vibrant. However, with each successive generation, a yeast’s character can change. It can become sluggish, produce off flavours, and develop a generally bad attitude. Several factors can cause these changes, from subtle genetic mutations that accumulate from successive culturing, to the introduction of wild strains of unwanted bacteria or yeast, among others. If you’re careful, you can expect to get four or five generations from a pure yeast start—but, for most, five generations is probably the top-end. If you start to notice odd flavours creeping into the beer you ferment from a recultured yeast, it might be time to retire the line. Most importantly, rely on your senses. If you open a culture jar and notice off odours, don’t use it. Washing yeast and reusing it is a great way to stretch your yeast dollar and cut down your cost per batch. But don’t wash yeast for the financial benefit; wash yeast to honour another living being who works harder than anyone or any thing with the unitary purpose to bring you beer. Apart from family, there are two things that for me make life worth living. One, as you might have guessed, is home brewing. The other is fishing. Both are intensely satisfying ‘Zen’ activities. They each involve skill, and neither can be truly mastered even after a lifetime of practice. There’s always something more to learn. Taken together, they make a full meal and a damned good time! About a month or so ago, an old acquaintance asked me if I would join him and a group of regulars on their annual fly-in fishing trip in northern Canada. For one week each Spring, this group of six guys goes completely primal, unplugged, and disconnected from the demands of civilization. It’s a week-long celebration of lake trout, camaraderie, and beer . . . lots and lots of beer. One of the regular fishermen couldn’t make it this year, so there was an open spot. One that I was enthusiastically willing to fill. One of the other regular guys—one that would be on this year’s trip—paid me a visit last week so we could discuss what I could expect for the trip. There are rules, and I needed to be aware of them. Meals are shared, and each guy is responsible for cooking for the group on one day during the week. 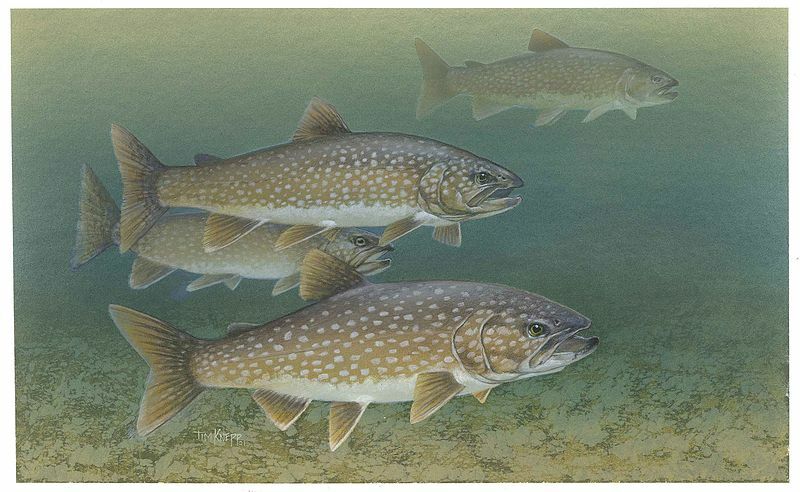 We are free to choose the menu on the day we are in charge of meals, as long as the menu involves lake trout. Also, because I am the newbie in the group, I would be responsible for bringing the single malt (of the whiskey variety, in case you weren’t sure ;). That is the rule, and rules are rules. I asked him about weight restrictions for the flight into our remote lake. Clearly, beer would be much heavier to transport than other options. However, he suggested that a 19 litre keg was probably lighter than an equivalent volume of beer in bottles and may actually be a great option for the trip. As a home brewer himself, he suggested that I brew a keg’s worth of beer especially for this trip. He could provide a much lighter CO2 canister than mine, as long as I could provide the regulator and the lines. A plan was hatched. My old plate-style grain mill. The beer would be called “Hook and Hops Pale Ale” in honour of its destiny. It would be a medium bodied American-style pale ale, with a strong, but not overwhelming, hop character. I aimed for something that would appeal to a relatively broad range of palates, not knowing the beer preferences of my fishing companions. It would also have to sustain my own beer requirements for the duration of the trip. Consequently, it needed to appeal to my preferences as a card-carrying Hophead. The recipe I developed made use of primarily North American ingredients. American two-row pale malt provided a sturdy backbone for the grain bill. The original recipe formulation called for about 9% of the grain to be 40 ºL crystal malt; however, my inventory would only allow for half of that. Therefore, 4.5% of the grain bill was 40 ºL and another 4.5% was 60 ºL crystal malt. This happy accident resulted in a beautiful golden colour that may have been a bit darker than what I was aiming for, but better suited to the beer’s developing personality. Generous and multiple hop additions, including varieties like Cascade, Chinook, and Northern Brewer, contribute a firm bite behind a malty front end. Two primary fermenters were used for the Hook and Hops owing to a miscalculation in my water usage. The contents of the two fermenters were combined in the secondary. Once it came time to add the wort and the 2.3 L starter to the primary fermenter, it was clear that once again, I miscalculated my water usage. This time, I overcompensated and ended up with more wort than would fit into a 19 L carboy. I pitched about 3/4 of the starter into the primary, but then added the extra wort on top of the remaining yeast in the starter jug. After primary fermentation, I combined the contents of the two fermenters which should make for an interesting blend. 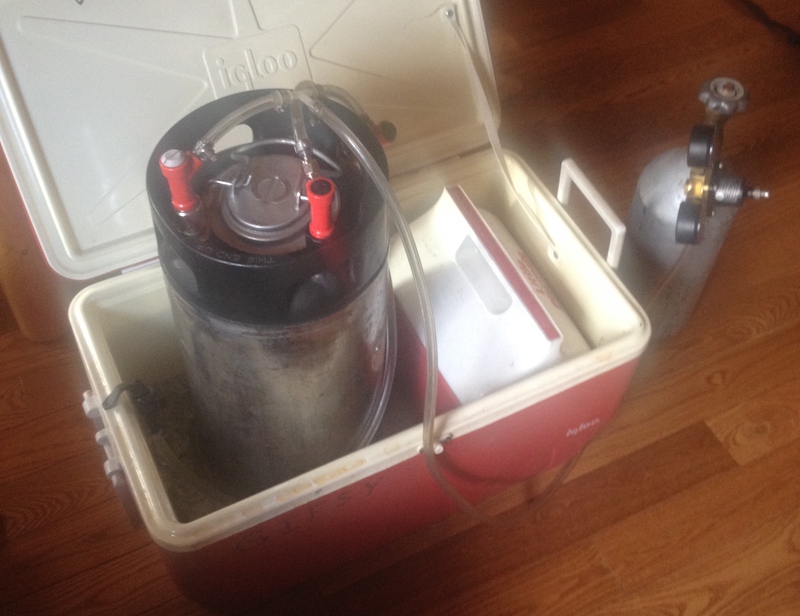 The beer is happily bubbling away in a secondary fermenter as I write these words. Once it is transferred into a keg, it won’t see the light of day except in a log cabin on the shore of some remote northern lake sometime in mid-June. I hope it stands up well to the inevitable and constant presence of lake trout. Either way and despite the mistakes, it’s a champion beer in my eyes, because it will be my first home brew made exclusively for a fly-in fishing trip. As a happy home brewer, there are few things more satisfying than pulling the first pint from a freshly tapped keg filled with one’s newest creation. This pint represents the culmination of all the thoughtful planning and research that went into the recipe design, the careful construction and maintenance of the specialized equipment manufactured for this specific task, and the vigilant oversight of all the minuscule details that can either make or break the final result. It represents the blood, sweat, and tears that so many of us sacrifice for our craft; it represents love. The first sip triggers an immediate judgment of everything that went right, and everything that went wrong; it’s the moment when the craftsman turns critic. It’s in this very moment that time stands still as flavour, texture, and aroma combine to bring the entire process around to full circle. This particular pint—the one before me as I write these words—represents for us a return to home brewing after a 15 year hiatus. The objective was to design a very simple recipe that would allow us to re-establish our home brewing chops while at the same time produce a beer that would appeal to a wide range of palettes. We fully expected to show this one off, like proud parents. As such, we chose to brew a light German pilsner, which we creatively named, “Laurie’s Lager,” after a dear friend who drinks only light ales and lagers, and who will likely put a significant dent in our freshly-tapped keg. The beer is not perfect, but it’s not bad, either. As I previously mentioned, we made some mistakes. But, all things considered, I think it could have been a lot worse. The beer pours very clear with a robust, frothy, white, and persistent head. The colour is a straw yellow, but with no visible bubbles below the head. In fact, it’s considerably under carbonated for the style. Saaz hops feature only weakly, both in the nose and on the palette—but they’re noticeably there. In retrospect, an American 2-row base malt was probably a mistake to emulate a true German pilsner because the malt is a bit too prominent and tends to overshadow the hops somewhat. Nevertheless, the beer is refreshing, crisp(ish), and will certainly be welcome during the hot barbecue season, especially served ice cold, and especially among friends. No, this beer is not perfect; but which beer is? My favourite beer is the one I have right now, and that’s a Laurie’s Lager. I remain on my relentless pursuit of the perfect pint. In retrospect, there are things we could have done differently—such as naming it, “Icebreaker.” And then again, there are some things I wouldn’t change at all. Everything. It may be a bit early to say that we’ve  “restarted a home brewing lifestyle” after a very long and protracted hiatus; but I think we have. Two batches of beer are in secondary fermentation, and one wine was racked this week. We have either built or purchased all new brewing equipment, we have on hand a full supply of CO2 with the intent of kegging what we brew, and we just purchased a second-hand freezer for our upcoming ‘keezer project.’ We have initiated this blog (although this is only the second post) and we have a Twitter account. It’s been about a month. I think that qualifies as a solid restart! The question is, how did it go? Were we rusty off the mark? What did we forget? What have we learned? It was not a flawless transition to go from nothing to a full-on brewing lifestyle. We had some old equipment that we pulled out of storage; some of it was useful (and we kept it), and some of it was old (and we chucked it). We have carted around with us over several moves an old rubber tote that contained all of our old brewing supplies. When we opened it for the first time, it was like opening a long, lost time capsule. There were old CO2 locks and stoppers, inoculation loops for harvesting yeast, and other useful stuff. But there were also a lot of old, unusable things: pH strips that had outlasted their expiry date, gelatine packs for yeast culture, spices and other crusty or expired ingredients, and various chemicals that I wouldn’t trust after all this time. We did, however, keep our carboys and kegs; but we had to toss all of the rubber tubing for our kegging system (as well as for our racking cane, and other miscellaneous tubing). We even discarded a CO2 regulator in favour of a new one because of oxidation on all of its fittings. It broke my heart to throw away my old mash tun and separate lauter tun of days gone by. But we rebuilt a fantastic dual-purpose mash/lauter tun (MLT) which is far superior to the one we got rid of. The new mash/lauter tun being tested on its first batch. Protip: Leak test your custom MLT with hot liquid BEFORE brew day! I will admit that I was a bit nervous when it came time to prepare for our first batch. All I could think about was, “What will I forget? What rookie mistake will I make?” It didn’t take long to learn what that mistake would be. Three days before the planned start date for our first batch, I began to prepare a yeast starter. I boiled some water on the stove and then added dried malt extract (DME) directly to the boiling water. Everyone who uses DME knows that if you add it to boiling water, it will boil over and produce a sticky, horrendous mess. And that is exactly what happened. The first batch we brewed was a simple German pilsner. Yes, the MLT leaked as soon as we added some hot grist. But we just stopped, tightened all the fittings and tried again. This time, it worked like a charm. The rest of the process went surprisingly well, until we got to the boil. This was the first time that we had attempted to boil 25 litres of wort on our kitchen stove. In the past, we never had any problem bringing our wort to a full boil. However, this stove just didn’t seem to have the juice to support a good, rolling boil. It took nearly an hour to even get to the boiling threshold, which is where I held it for about 70 minutes. Everything else went well, and that batch is about to be kegged within about a week of this writing. 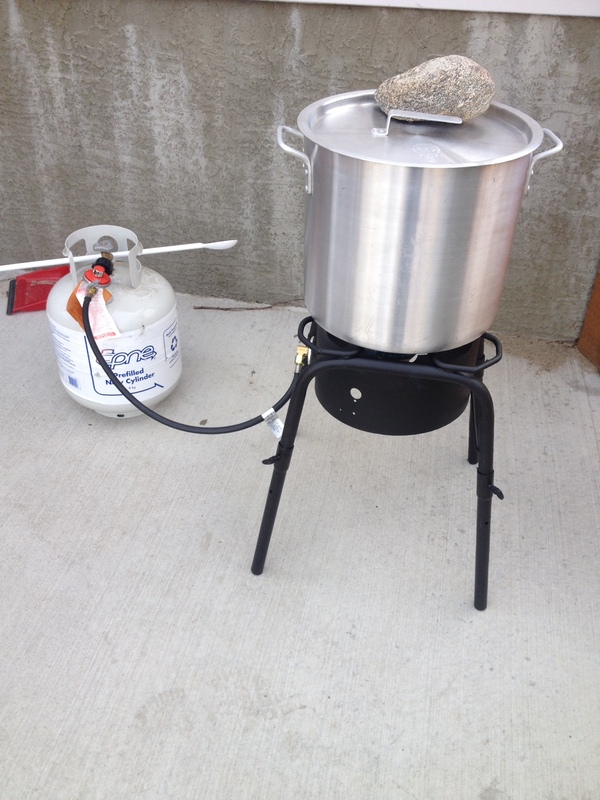 A 60,000 BTU propane burner is just the thing to achieve a rolling boil. The second batch was a dark(ish), American-style IPA. Knowing that the biggest obstacle to overcome was the boil, we purchased a 60,000 BTU propane burner, which seemed to do the trick. Because we managed to get a very good, rolling boil using the burner, I underestimated our water usage. We lost more water during the boil than I expected, which meant that we were a few litres short of finished product. Next time, we’ll have to account for a greater evaporative loss during the boil. So, overall, our climb back has been interesting and eventful. But it’s also been fun and enlightening. We’ve had to make a few simple tweaks to our process, but I’m confident that each new batch will go just that much smoother than the one before. We are definitely building momentum here in our new home brewery, but we still have a way to go. Thank goodness beer forgives the odd ‘rookie’ mistake! When I say “we” in these posts, in addition to me I’m talking about my partner in crime—my wife, ‘L’—who has been brewing with me since about 1992. Although she considers herself a novice, I think she sometimes surprises herself with what she knows about beer, wine, and the entire brewing process. As I write these words in my first ever blog post it’s becoming increasingly obvious that I am way out of my depth. Please bear with me while I get my blogging sea legs, and thanks for your patience. 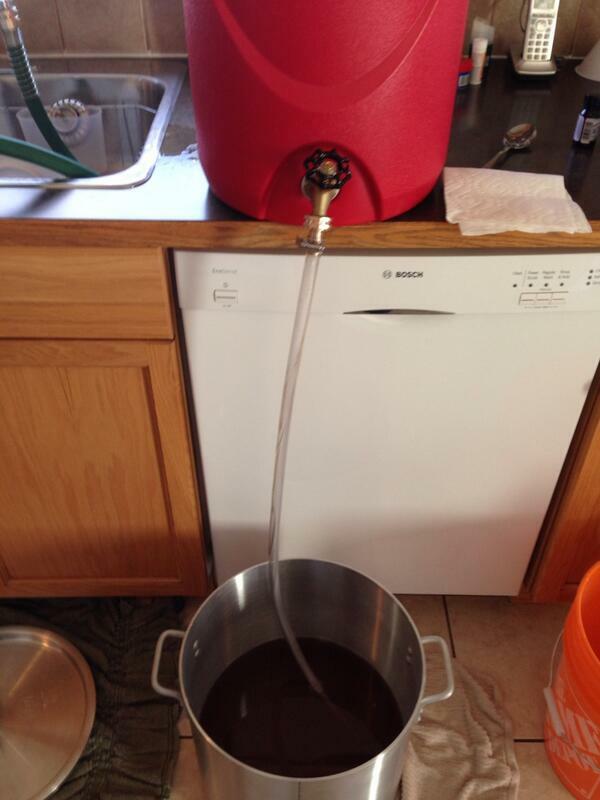 Home brewing can be as simple or as complex as you want to make it. Part of the appeal of home brewing is that no matter where you fall along the simple-to-complex spectrum, you can make your own brewing process distinctly yours. Some of us are obsessive data collectors and number crunchers; others prefer a more ‘organic’ fly-by-the-seat-of-your-pants approach. Some like the challenge posed by mutli-step mashing, while others prefer the simple single-step infusion. Some design recipes with long (and often bizarre) ingredient lists, while others keep their ingredients to a minimum. And some—maybe most—find a balance somewhere in between. My own philosophy is to keep it as simple as possible . Some recipes can definitely benefit from complex procedures, such as decoction or multi-step infusion mashes. Some require long lists of ingredients. The individual recipe really dictates the degree of complexity required for a particular batch. But for the vast majority of recipes an average home brewer might attempt, simple procedures are often a better choice than more complex ones. Simple recipes require simple procedures, and simple procedures translate into fewer opportunities for mistakes. It’s only after mistakes have been minimized that consistency begins to emerge. I don’t mean consistency in the sense of always brewing the same recipes using the same procedures. Rather, I’m talking about the kind of consistency that allows a home brewer to develop his/her own style. This is the kind of consistency where people can taste one of your beers and know it was made by you. It’s your signature, batch after batch. Simplicity and consistency also affords a brewer an opportunity to manipulate variables and make accurate predictions about the effect those manipulations will have on the final product. With each additional step in the process, and each new ingredient added to the recipe, a small measure of uncertainty is introduced. The cumulative effect of all of these uncertainties leads to unpredictable results in the finished beer. The best way to ensure consistent and predictable outcomes is to simplify your process. But at the end of the day, home brewing is a hobby. It’s what we do in our spare time. It’s what my wife and I call ‘Zen time.’ It’s a creative outlet that provides us beer in the end. There’s nothing wrong tossing caution to the wind from time to time and be surprised by the result. It’s part of the fun of it all. And that’s why the second element of my brewing philosophy is to do what makes you happy. I think there is a definite place for serendipity in home brewing, especially in the creative process. In my early brewing days, caution was thrown to the wind more often than naught, and sometimes (mostly) the results—although completely unpredictable—were surprisingly good. 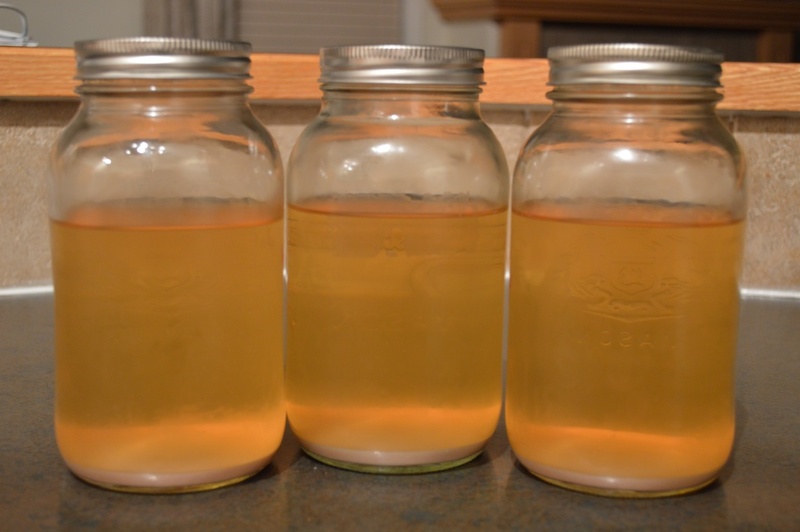 Sometimes careful experimentation in home brewing, and tinkering with different mashing techniques or different ingredients can aid in the learning process. The point is, whether you’re trying to achieve consistency and a personal style or whether you want to try all the latest gadgets and all the newest or most sophisticated techniques, using simple or complex ingredient lists, do what makes you happy. This is supposed to be fun, after all! But if you really do want to take complete control over your craft, simplification is key. As I mentioned above, this is my first blog post. As we get rolling here, you will come to recognize that by and large we adhere to this philosophy pretty closely. Most of our brewing activities are quite simple. When we manipulate variables, we tend to do it one (sometimes, two) at a time. But then again, sometimes the rules fly out the window and home-brew recklessness rules the day. It’s what makes us happy! Do you have a brewing philosophy? If so, what is it? 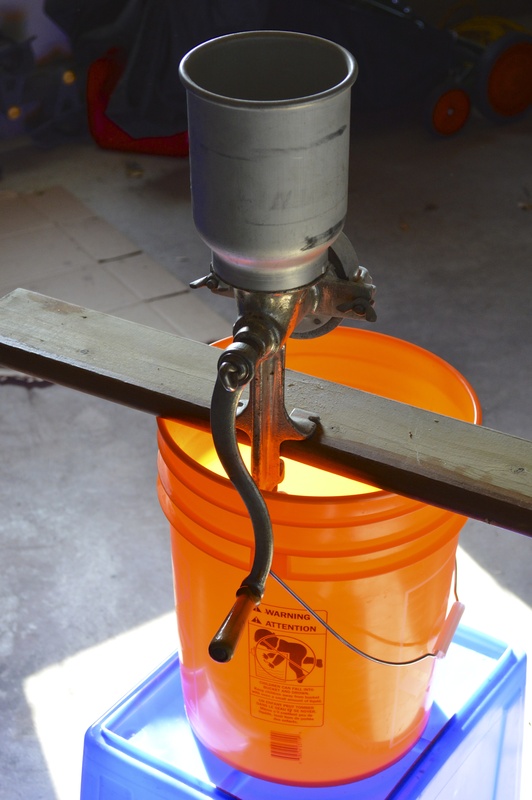 Note: While I was developing this post, I came across an article from the American Homebrewer’s Association that had the same basic message that I was trying to convey about keeping things simple.